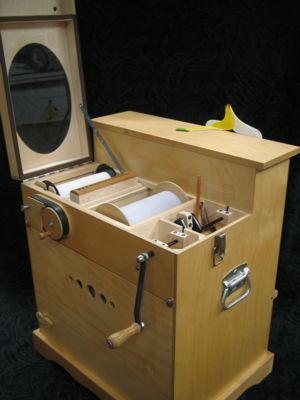 Daniel's first animated Bird Organ was shown on this web site in 2003. Now he has sent me details and photos of his latest creation, which looks even better than the original. He calls it "Monkey Business" for obvious reasons! 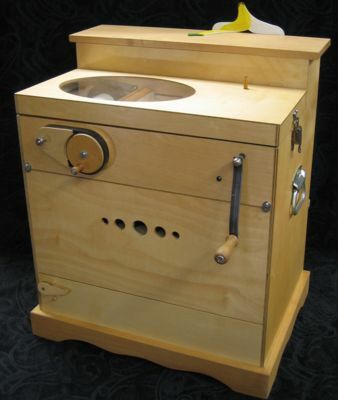 It is based on the John Smith Senior design, and has animation (of course) tapped from the crank and bellows. Monkeys and street organs just seem to go together. I thought that a renegade monkey running amok could be an amusing presentation for an organ facade. I did a very quick sketch, then very minimal refinement so as to keep a simple primitive look. I'm always thinking of movement within the design, as I'm sketching. 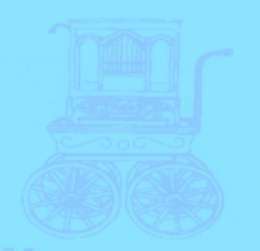 The movements are determined by the design, I then work back inside the organ to tap onto moving parts to acheive the motion. Range of motion is trial and error, adjusting lever length and pivot location using temporary cardboard pieces as stand-ins. 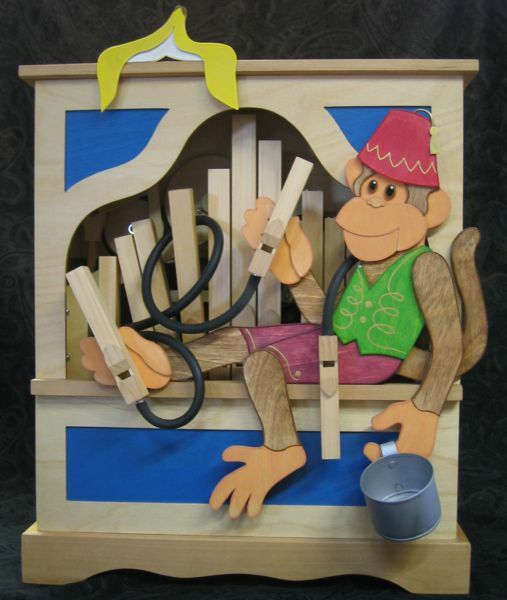 The monkey's leg (swinging back and forth) and the foot (tapping pipe) are driven from the front bellows. The hand holding the pipe gets its motion from the crank shaft. All three of these pipes are playing pipes, the longer tubing runs don't seem to matter, with the higher air pressure of the Senior organ. 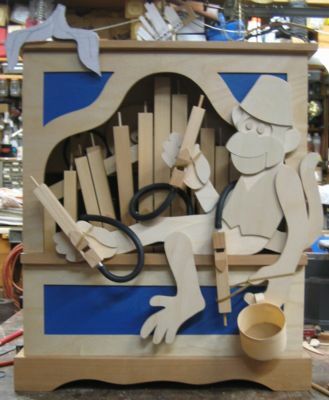 I wanted an 'interactive' feature in the design, so the monkey's jaw is controlled by a lever at the back of the organ case. The smile can then be effectively dispensed at appropriate moments! First assembly of unpainted monkey. 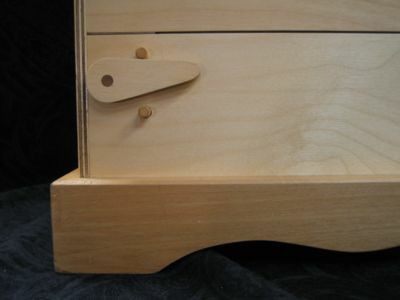 Casework and monkey constructed mostly of Baltic birch plywood from hobby shop. 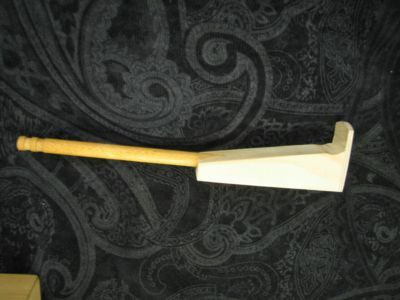 Pipes of basswood with maple caps. Overall view of organ back showing clutch rod, draw catch on lid, rewind crank, smile lever, etc. Back view of monkey showing animation linkage for leg and foot/pipe. The circular disc swings the legs in opposite directions. 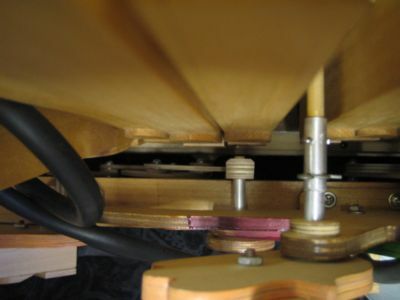 The disc is rotated by the vertical link, which fastens to the front bellows board. 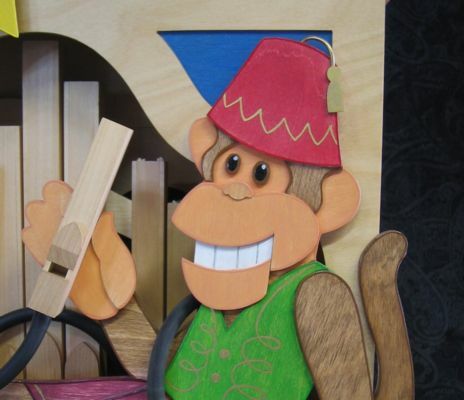 The monkey's hand/pipe is operated from the crankshaft. 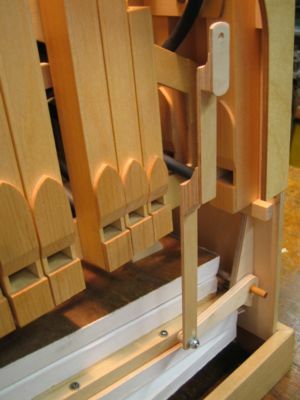 The brass link swings the vertical arm which pivots at the base, moving the crossbar and rotating the dowel on the right. 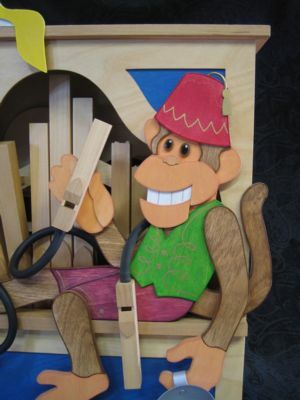 The dowel extends through to the front of the organ, where it is connected to the monkey's hand by a short length of tubing (right photo). 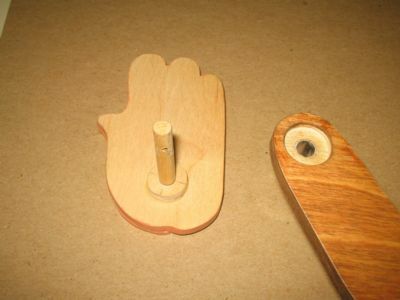 Back of monkey's hand showing the dowel mounting block and countersink in arm. Thin wall aluminium tubing inserted as bearing surface. 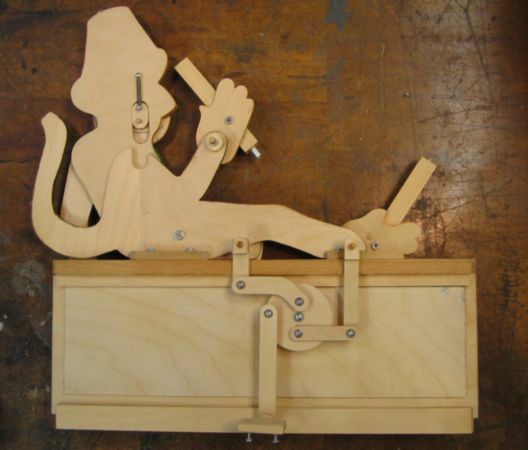 This is the thumb lever on the back of the organ, to actuate the monkey's jaw movement for smile. Smile actuating linkage (behind fascia). Monkey smile! Wonderful for crowd interaction! 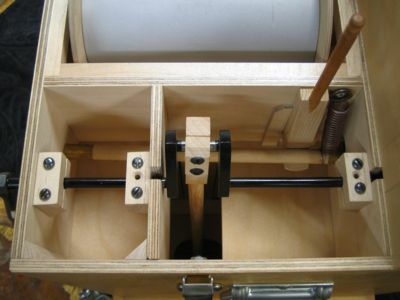 Clutch wedge: Drill block for 1/4" dowel and shape block to wedge. File slight detent at base to hold idler wheel axle. Cut dowel rod to give 3/4" protrusion through lid. 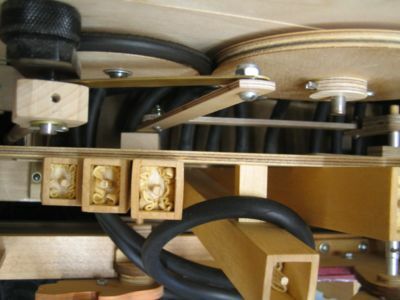 General layout of pressure box. 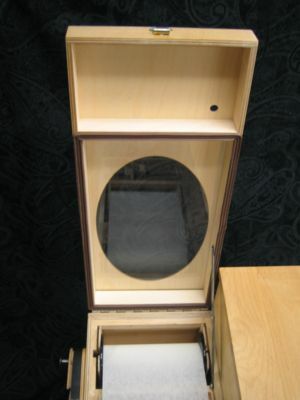 Lid details: 1/4" plywood framework. 3/32" plywood for top with 6 x 9 oval opening. Cut rectangle of 1/8" Plexiglass then add 3/16" plywood pieces on inside faces of frame to hold Plexiglass in place.